One hour after Jimmy Fallon fussed with Donald Trump's hair and joked about his McDonalds habit, Seth Meyers called Trump a Jack-o-lantern, mocked his businesses and interviewed Bernie Sanders. Fallon and Meyers are back to back on NBC. Is there a rift between the 11:30 p.m. host who admits to lobbing softballs and the 12:30 a.m. host who says Trump is a "racist" and a "liar?" Meyers says there is not. There are good reasons for the big differences between "The Tonight Show" and "Late Night," Meyers told CNNMoney in an interview this week. "I think when you look at the 11:30 shows, they're different kinds of TV shows," he said. "Some people want to turn on TV... and they want to see hard takes on politics and they want to be reminded of everything that's going on in the world. Other people use it for escapism." In other words: There should be both. "I think it's important that those shows still exist for people who want to tune out politics for a night and I think Jimmy does that better than anybody," Meyers said. "I think he's an entertainer — I think he's an entertainer with skills at a level far beyond what I will ever possess. I think that's why people prefer his show to everybody." Fallon also scores the interviews because the candidates know they're unlikely to face probing questions about tax returns or email servers or charitable donations. Fallon's gentle approach with Trump has been derided by TV critics, and by fellow late night host Samantha Bee, in recent days. Asked about the general outrage over easy-going Trump interviewers, including Matt Lauer's much-maligned interview of Trump earlier this month, Meyers pointed out that "an interviewer only controls half of the interaction." "When you watch the way he answers questions, ultimately, everybody, the very best interviewers have to give up eventually or else the whole conversation will just be 'Yes you did,' 'No I didn't.'" He said "it's impossible to even imagine Donald Trump getting asked a question in a way where he would feel shame or embarrassment and concede the point. I think he's very good at that — preternaturally good at not giving in that he's in the wrong." Earlier this year Meyers jokingly banned Trump from his "Late Night" show, knowing full well that Trump would probably never come on the show anyway. "I think it would be interesting television if he came on our show, but it's a moot point because it's not going to happen," Meyers said. On Monday Meyers delivered a ten minute "Closer Look" commentary about Trump's abrupt reversal on the subject of President Obama's birthplace. The Atlantic said the segment proved that Meyers is "the Anti-Fallon." During the segment, Meyers focused on Trump's past embrace of the "birther" conspiracy theory, saying that "Trump built his career as a racist liar because he is a racist and a liar." "When we use those words, we make sure we back them up," Meyers told CNNMoney the next day. He said the NBC network has "never told me to tone it down." "If anything, when I first started my show, and it was less pointed as we were finding our footing, and we were doing point-of-view things a lot less often, NBC came to the show and suggested we do more of it," Meyers said. "Not only have they never told me to pull back, they have been nothing but encouraging." Meyers hesitated when asked if Trump is the best thing that's ever happened to late night TV. "There's certainly days where it seems that way, but then there are also times where it's hard not to feel like you're being redundant and that you're repeating the same things over and over again," he said. 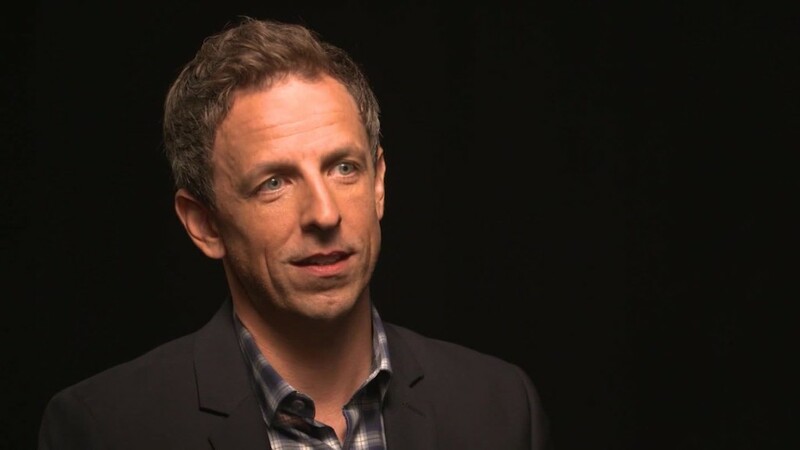 Hear more from Seth Meyers on Sunday's "Reliable Sources," 11 a.m. Eastern on CNN.